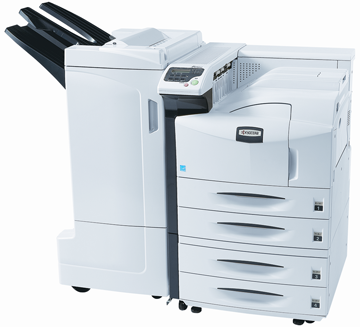 Description: Businesses with high-volume print jobs and applications will always look for a dependable and productive device, and the FS-9530DN ECOSYS® Printer fits their needs. With fast print speeds of up to 51 pages per minute, standard duplex and 1,200 sheet paper capacity, the FS-9530DN can be configured with optional finishing and additional paper handling to meet the requirements of the most demanding environment. With a standard network interface and extensive print features, the FS-9530DN and Kyocera’s low Total Cost of Ownership will provide a winning combination for every customer.